Home » How to Save and Grow Healthy Milkweed in Continuous Growing Regions? How to Save and Grow Healthy Milkweed in Continuous Growing Regions? If you are a regular reader of this blog, you probably know I’m a Minnesota gardener. What you might now know, is that I am contacted about gardening/raising monarchs from enthusiasts across the country. Two questions I get repeatedly are from those in warm regions. 1. How can I keep up with the demand for milkweed? 2. Why are so many monarchs emerging from their chrysalides weak/sick?. These questions are related so I’m here to start a discussion to see if we can start considering new solutions to these common issues. The results are startling you see the success that gardeners are having in continuous growing regions with tropical milkweed compared to all other varieties…in fact, Asclepias curassavica is the only milkweed species where gardeners had a success rate over 50%…in fact, it was over 60%! When you see these results, it’s easy to understand why more gardeners plant tropical, and why more nurseries carry it than hard to grow native species. Until people in these regions are able to grow other varieties with more success, the path to planting only native in these regions seems implausible. 1. Further polls should be conducted for specific regions- I realize I left out some crucial milkweed options here depending on the region, including Asclepias fascicularis (narrowleaf milkweed) which is widely planted in California, Asclepias speciosa (showy milkweed) which is native to the western half of the US and Canada, as well as other lesser known natives specific to Florida, Texas, etc..
2. What can gardeners do to have more success growing native milkweed species? 3. Are some of the non-native milkweed species good options for particular regions? 4. Which species (in addition to tropical) would gardeners be most interested in buying from a nursery? 5. How do success rates differ between starting with seeds and starting with plants? 6. When is the best time to start seeds in specific continuous growing regions? 7 .What are the most effective milkweed propagation techniques in specific regions? Question 2:Which species of milkweed plants have you unsuccessfully tried growing in continuous growing regions? While Asclepias incarnata (swamp milkweed) is a reliable northern perennial and blooms prolifically in regions where it dies back in winter. It is not the same thriving plant in continuous growing regions. This question is directly related to the first, so ponder those same six questions above. Question 3: In your continuous growing region, do you grow milkweed in containers or planted directly in the garden? This means many of you will have more options for growing healthy milkweed, as we will discuss in an upcoming poll question. a. What are the pros/cons of container plants? b. What are the pros/cons of planting directly in the garden? Question 4: Is running out of milkweed for monarch caterpillars a problem in your continuous growing region? There’s a good chance (at some point) you’ll have caterpillars wandering around your garden with no viable food source. a. What would happen if all the monarchs survived in continuous growing regions? b. Is it benefitting or harming the ecosystem if you try to to save all the monarchs in your garden? Question 5: Do you cover milkweed to let plants mature before hosting monarchs? The vast majority of gardens in continuous growing regions are open 24/7/365 for monarch eggs and caterpillars. Milkweed plants in continuous growing regions can be reused and overused all season long. a. How are overused plants contributing to monarch diseases in continuous growing regions? b. What would be the benefits of covering milkweed plants? c. What would be the downside of covering milkweed plants? Question 6: If you cover milkweed plants, how do you cover them? 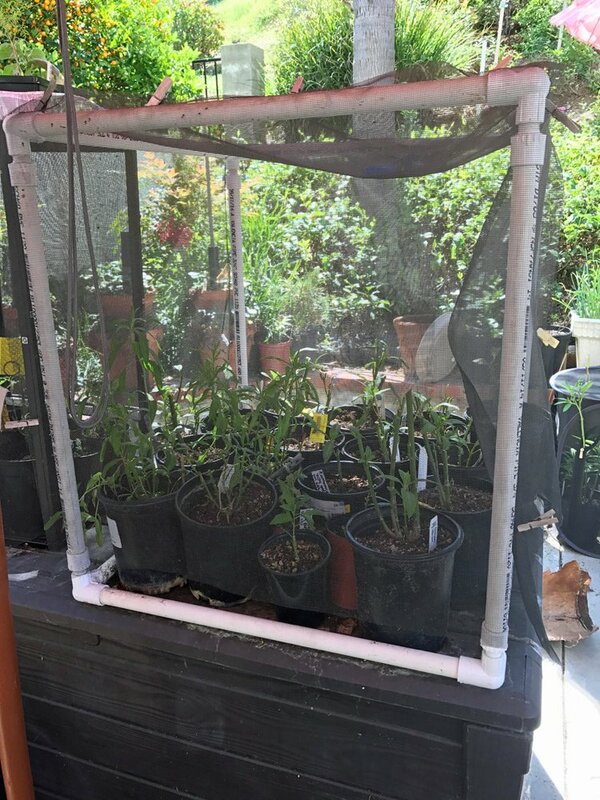 The solutions that make the most sense for you will depend on whether your goal is to simply grow milkweed before offering it to monarchs, or using an outside enclosure to protect growing monarchs. 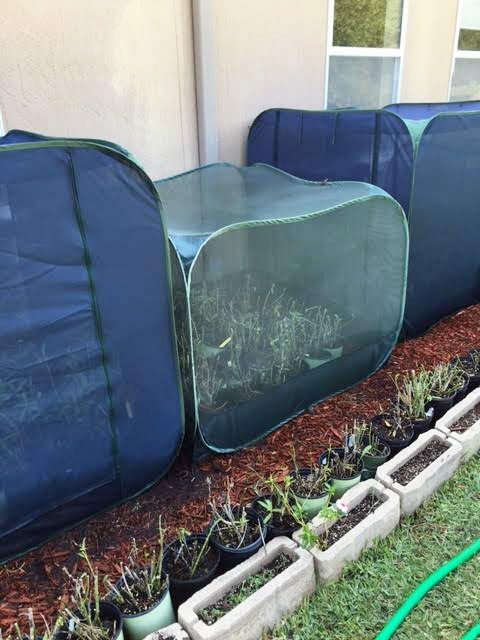 Gary says this helps his milkweed seedlings establish themselves in Florida. These are just a few potential solutions for growing milkweed in continuous growing regions and I will be adding more as I discover new solutions. 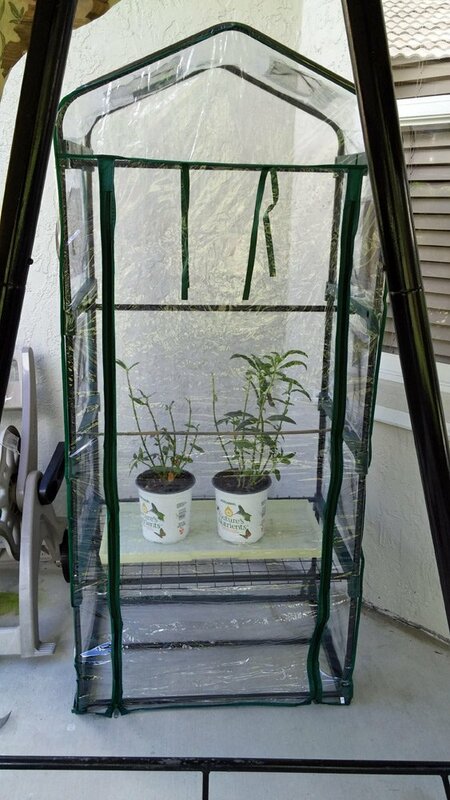 Bottomless options or those with larger holes will allow more predator entry if there are monarchs inside, but will still allow you to grow healthier milkweed. 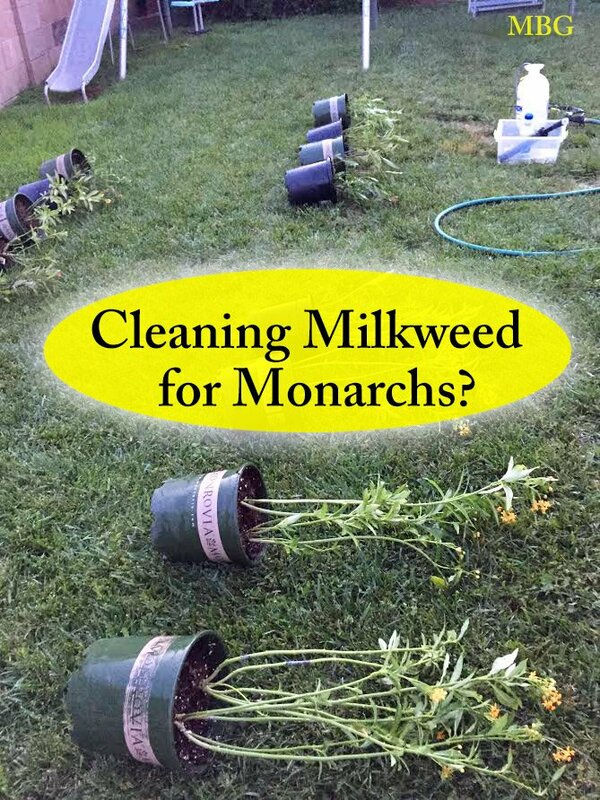 Question 7: After one batch of monarchs devours milkweed in your continuous growing region, do you clean/disinfect plants before the next eggs are deposited on the plants? Most people in continuous growing regions are not cleaning/disinfecting plants on a regular basis. If OE protozoan parasites are present on plants, a high % of butterflies will be unhealthy. What is OE and how does it affect monarchs? a. Since monarch females can spread OE spores on the bottom of milkweed leaves, what are the best ways to effectively clean/disinfect a plant? Question 8: If you clean or disinfect garden milkweed, what techniques do you use? 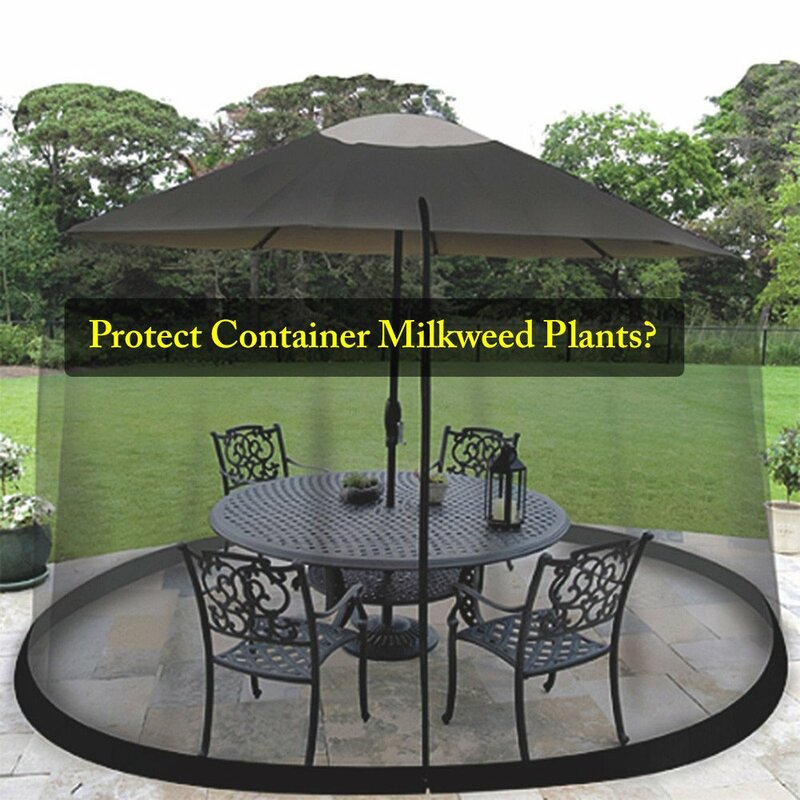 Of the minority of people who clean/disinfect plants, most cut back milkweed stalks and/or rinse plants with water. If water doesn’t effectively remove disease spores, it’s easy to understand why OE is so problematic in these regions. Perhaps laying containers so they hang off on a picnic bench or table might work better, in case there are OE spores on the ground? a. Can rinsing plants with water effectively rinse away OE spores from milkweed leaves, stems, etc. b. How effective is a bleach solution for killing OE spores? c. Is bleach potentially harmful to monarchs eggs/caterpillars or other wildlife? e. Is hydrogen peroxide potentially harmful to monarch eggs/caterpillars or other wildlife? f. What is the most effective technique for cleaning a plant? Question 9: If a landscape or gardening company offered a paid service for covering/disinfecting garden milkweed plants in continuous growing regions, would you be interested? 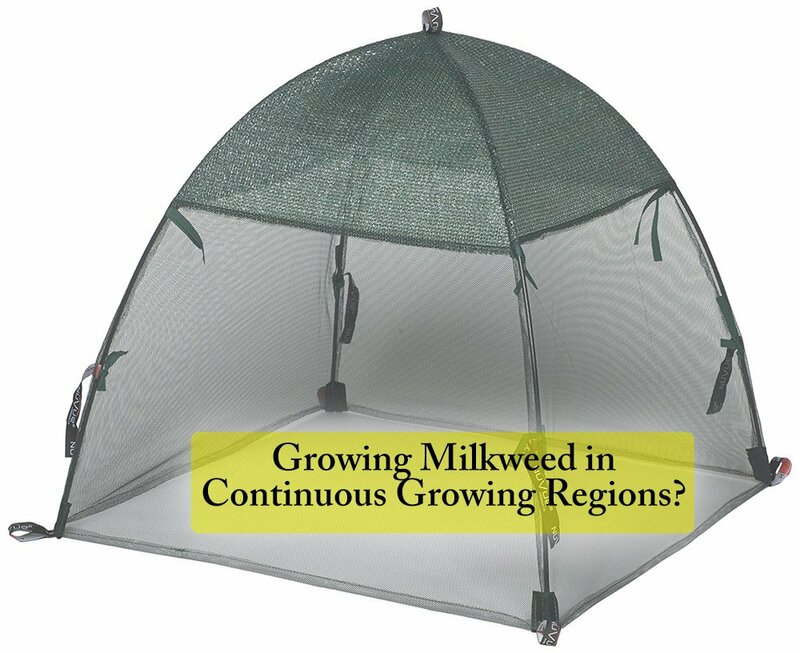 almost 40% of the respondents would at least consider some type of service in continuous growing regions for milkweed care. There is an opportunity for local landscape companies to offer services to specifically deal with growing and caring for milkweed. b. For local service companies, what services could you provide? There are many options to consider for saving more milkweed in continuous growing regions and keeping it clean to support a healthy monarch population. 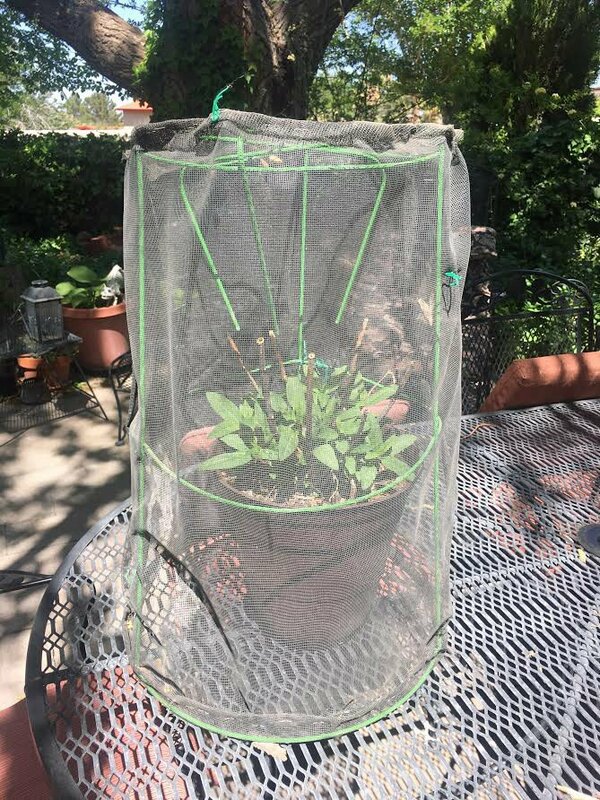 When adding monarchs to outdoor protected plants things can get a little tricky because of persistent predators, but this is not an impossible challenge to overcome for the creative gardener/monarch enthusiast. If you want to boost their numbers even more, bring a few inside and follow/tweak a good system for raising healthy monarchs indoors. Thank you so much to everyone who submitted a survey and contributed their ideas. If you have other questions or comments, please post them in a comment below. Hi, thank you for this wealth of knowledge. I live in southwest Florida, and have had a lot of success with tropical milkweed. I am wondering if I want to grow swamp milkweed or butterfly weed, do I have to do the cold stratification process? Also if I do keep using tropical milkweed, what do I need to do to make it safer as far as cutting back. Thank you. Any milkweed that grows continuously in your region should be cut back 1-2 times a year to avoid the build up of pathogens that cause monarch diseases. I have a chrysalis that has formed, but it is misshapen because most of the skin did not peel up when it should have. It seems to be developing and Alive, should I try to remove the skin at this point. It is over a week old. Just got hooked on butterfly gardening. Planted many wildflowers in February and produced many flowers. I have not had much success starting milkweed from seeds as yet. purchased one Showy milkweed plant which is now about foot and half tall. seen 3 or 4 Monarchs so far here in Arizona. Now have mucho Asclepias incarnate seeds in fridge to plant in June. Most will go into pots. Hope to be more informed this time next summer. Have been following Mr. Lund on YouTube for lots of good info on Monarchs. I am really concerned about the OE factor. Lets save the Monarchs! Hi Ray, congrats on your new garden. I would get those seeds started ASAP as the sweltering heat of summer is not the best time to establish seedlings…good luck! Hi! First, thank you so much for the wealth on info found on this site. We have just recently started a butterfly garden and have Monarchs in every stage from egg to a newly hatched butterfly, still drying its wings! It’s been an amazing experience for us to watch the cats go through the entire process. I am concerned though, as last night we had one go to J stage and then this morning I observed it beginning to pupate. It was contracting and a small green part was emerging. We missed this part of the process with our last cat, so I attempted to take some photos. In doing so, I very gently moved the container that the cat had attached itself to. Since then, he hasn’t continued pupation. He stopped contracting and still has only a small part of the green showing and his skin is just barely retracted. My question is, could the movement of the container have disrupted him enough to stop his transformation to chrysalis, or do you suspect it was something else that could have caused this? I’m so disappointed that we won’t have this one go through the complete transformation to butterfly, and I definitely want to try and avoid this in the future if possible. Thank you so much! 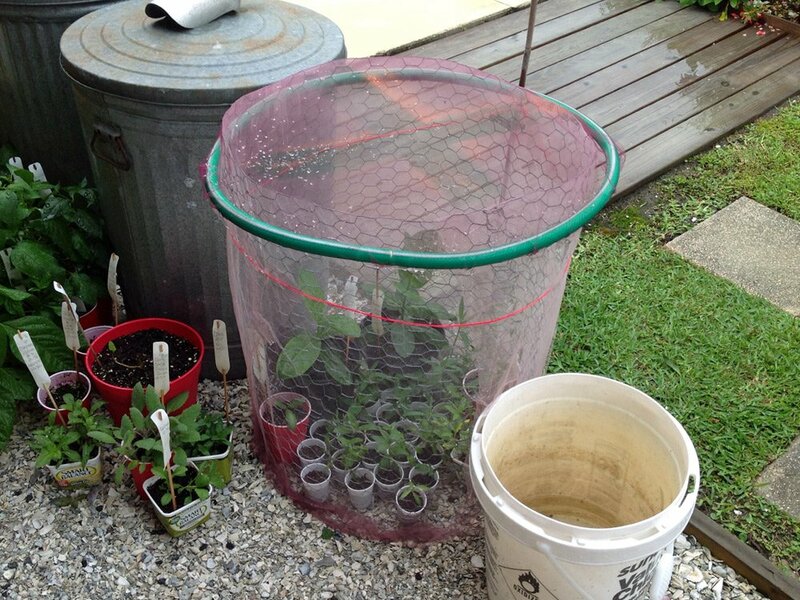 Hi Bobbi, moving the container gently would not cause the monarch to die….when this happens, it could be due to parasites (if this was the case you would see fly maggots/red pupae fall to the floor OR that milkweed was treated with an insect growth regulator. It’s hard to say for sure, but those are the likely suspects. I gave my daughter & her spouse some milkweed for their new secret garden and we have created a Monarch monster. Right now they have over 50 cats and 30 chrysalises and eggs to numerous to count. I think their secret is all the fruit trees and plants that are blooming right now in Jacksonville Beach and Neptune Beach, Florida and the fact that their garden is secluded and protected and has such a wonderful mix of all kinds of plants including so many citrus and other fruit trees and flowering fruit plants & shrubs. I had caterpillars early on in January and February, but have had none since March. My garden is more of a full sun, right out in the middle of everything butterfly garden. I am hoping to expand the butterfly more as the year goes on. Would also like to start a night moth garden. I have enjoyed reading the results of the survey. I did not participate since I just moved to Jax Bch the end of last year so didn’t really have much to contribute. I would be interested to know what you recommend for treat the Milkweed with and proportions you mix to treat it with. Also is it better to water in the morning and afternoon instead of late evening & at night? I think I read somewhere that the Monarchs are very susceptible to cold & wet and can die from, I guess, hypothermia? I think I missed what you rinse the milkweed with to remove OE . Can you repeat the instructions? Thank you so much for your blog. Thoroughly enjoy it! I was one of those hard heads that thought putting entire plants the cage with the caterpillars was the way to go. That was until I experienced the worst outbreak of OE of the century !! Caterpillars were dying, chrysalises were oozing, and if butterflies did exit from the chrysalis, most of them were so deformed, I had to freeze them ! What a disaster. Almost made me want to give up this hobby. Until I educated myself. I began decontaminating the eggs, the plants, and the cages. I began placing leafs and cuttings only in the cage. I clean the cage twice daily. I now have a wonderful batch of 15 fat, healthy caterpillars in my baby cube. I am so happy now, and I would NEVER put another entire plant in with my cats. Another thing with this bad practice is, there is no way to clean the frass, there will be mold, and it just keeps the cats dirty, which causes disease. Hi Natasha, I’m happy to hear instead of giving up, you made some changes and are now having success…congrats! We have collected over 30 cats so far and released (5) monarchs. We have another 20 chrysallis waiting to hatch. We are in Houston, TX. Bought (18) new Milkweek plants in addition to the 12 that came back. Planted many seeds and have many tiny milkweeds trying to grow. oh so slowly. Much to my horror the rabbits ate all the blossoms and leaves from 1 asc. curass., but left the other 5 plants alone. I am protecting the rest with chicken wire. This a.m. I saw a big (1 1/2″) unknown yellow butterfly circling the milkweeds, yea. My milkweeds seem to grow too slowly. Lots of flowering plants/trees around my house. I live in South Florida and really appreciate your website. I have been providing my Monarchs Tropical Milkweed plants from local nurseries for several months. My involvement in minimal, mostly putting new pots where needed for the hungry cats and cutting back plants as needed. I have had good success. Here’s the problem: I had been getting the Tropical Milkweed plants with red/orange flowers, but in a pinch brought home a few Tropical Milkweed plants with yellow flowers. When I bought them, the person at the nursery said the only difference was color. By the next morning I had a dozen dead cats. When I called the nursery about this, the manager said everyone knows you cannot mix the two colors because it will kill the cats. Really? In all of my research about doing this, I have never seen that info anywhere. In fact, I see info that suggests providing a variety of milkweed in the garden. Please advise. I am so sad. Thanks for your poll work. For the good of many, I want to thank you for getting involved in polling your readers!!!! You have a resource available to only a very few for understanding the whole picture (milkweed, population, modifications/changes in locations, diseases, predators, etc). We need a lot of data. Hi Gary, I’m hoping some of the info here (I’ve added a bit more since the post was published) will at least spark a few ideas about alternative solutions for growing more milkweed and supporting healthy monarchs. It would be ideal if scientists/enthusiasts who live in these regions would research these issues further and come up with some viable solutions that will have a positive impact on monarchs in continuous growing regions. pollinator plants around the garden fence. We will be use the information presented here in deciding what to plant. It would be great if this information is available in PDF format for sending to other garden members. One other thing. I live in south central PA. Our milkweed dies off in the winter and it starts all over again in the spring. I am waiting to see how this years crop turns out. I stratified the seeds but I did not plant them in winter containers. I will wait see what to see how this years milkweed crop turns out. As I previously reported, I did not see many Monarch over the summer but I feel successful since I am sure the butterflies I released are the last instars of the summer and the Monarchs are flying south to Mexico. This year I have had 100% survival rate on cats brought inside as eggs and raised on cutting from my garden and a 90% survival rate on cats brought insideand raised from cutting. None of the above have yet progressed beyond chrysalis so far, but I am hoping they will all survive. I’ll answer some of your questions on your survey. Dear Tony : I’m soo happy !! This year it has been very good for My monarchs and Queen Butterflies. I already released around 30 Monarchs and 20 Queens !! And right now I have an invasion of Monarchs laying eggs over my Giant milkweed ! A[so I have about 25 caterpillars ready inside the cage( I bought from you ) to become chrysallis !! I been enjoying my season very much !! Thanks !! As a grower, I learned that many growers will add an insecticide to their plants to prevent insect damage before the get them to market. I make it a point to bring any Plants That I don’t grow myself, keep them isolated from my garden for a week two. I don’t want to expose my established Garden to any chemicals or insects to what ever someone else may have put in them. Did I miss something! I live in central Florida and have plenty of Milkweed, of course the tropical Milkweed, but have no other option. I have started. Group here, now up to 20 people and growing. Up to now I only knew to cut back all Milkweed twice, to ward off the dreaded OE problem. Your Email talked about cleaning the actual plant. Is that a safe option? Hi Jo Ann…your point is part of what this post is addressing. Tropical milkweed is by far the easiest to grow in your region which is why you plant it and why it’s so easy to find at nurseries. There are potential issues with disease because tropical milkweed is a continuous growing plant. I’m hoping that people start to realize this isn’t a plant vs. don’t plant discussion, but an opportunity to discuss how to grow other species with more success, and how to make tropical milkweed a safer option for Florida (and other continuous region) butterflies. Yes, bringing in eggs makes a difference if you are thoroughly rinsing milkweed. Tony- this is one of the best articles yet! We are in Cypress, CA and having a GREAT year so far. Have released about 35 in the last 3 days and have about 50 more waiting to hatch. It’s to the point that we are not bringing the Cats in until they are about to “J”. We have 3 cages going now. Thanks for so much great info. Thank you so much for creating the poll and publishing the results, very educational! Keep up the good work! Thanks Carol, I’m hoping it will start a discussion on what can be done to grow more milkweed in these regions and produce healthier butterflies.